Winter is on the horizon and you know what that means…it’s soup season! 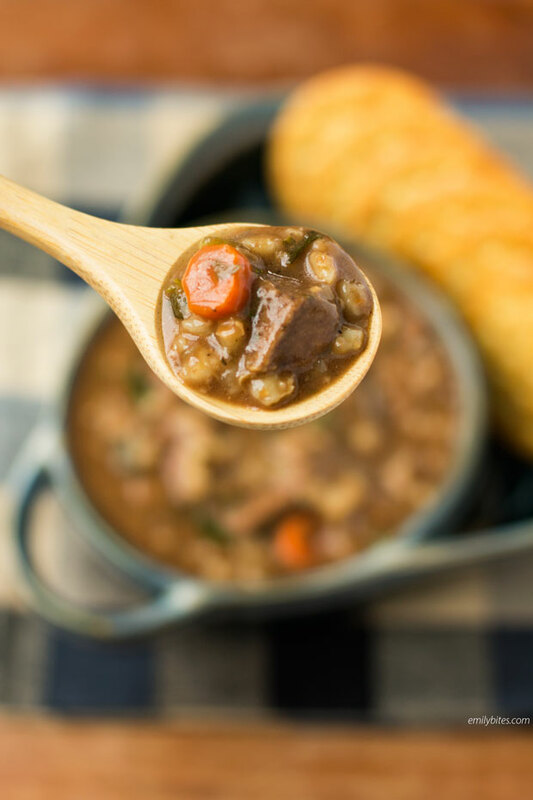 This Slow Cooker Beef and Barley Soup is rich, hearty, warm, comforting and a huge, filling serving is only 275 calories. Plus, it really couldn’t be easier to make. Just chop up the ingredients, toss them in your slow cooker, go to work and then come home to eat a nice hot meal. Don’t you love recipes like that? You can also cook it faster on high if you’re preparing it in the morning to be ready for Sunday football or lunch. The serving is really generous, so if you want to eat your soup with a sandwich or salad you could always eat a half serving. In the mood for more delicious lightened up soups? Check out my Broccoli Cheddar Soup, Zuppa Toscana, Creamy Chicken and Wild Rice Soup, Butternut Squash Soup, Italian Wedding Soup, Cheeseburger Soup, Spaghetti and Meatball Soup, Slow Cooker White Bean Soup, Chicken Tortilla Soup and more in the soup section of my recipe index! Place all ingredients in your slow cooker and stir to combine. Cook on low for 8-9 hours or on high for 4 hours. This looks great and I can’t wait to make it. As a buffalo transplant living in the south I have made and loved so many of your recipes. But! I’m commenting right now because I HAVE to know, where did you get those bowls?!?!! Haha, they’re from lakeside.com, just go there and search “soup bowls” – I have the blue and green set! I hope you love the recipe too! I just bought the bowls and I’m making the stew this weekend! This is my favorite website and I haven’t made a bad recipe yet!! I love your recipes so much and this one looks like a winner! Going on the menu for next week but I’ve never cooked with barley. Is there anything special to know about cooking with it or a good substitute?? Thanks for bringing us amazing recipes!!! Oh my goodness this looks so warm and tasty. If I had the beef I would make this today while it is raining, raining, raining. I love barley in soup. I have used it in chicken soup and with ground beef but this looks wonderful. Makes me want some at 8:22 in the morning here in North GA. Thanks Charlotte! I hope you try it and love it :). I agree, I love barley! You could definitely just leave out the mushrooms or throw in an extra stalk of chopped celery and it would still taste great. I wouldn’t suggest broccoli. I hope you both love this! Thanks Mary Beth! I hope you love the soup. I’m having a grilled cheese with 1/2 a bowl for lunch today! This looks yummy!! It’s been cold here, and I’ve been in a soup mood lately. I made your white bean soup yesterday, which is great! I’m definitely going to try this one when I finish the leftover bean soup. Thanks for another yummy recipe! Thank you for this recipe! I forgot I’ve got half a bag of barley that has been sitting in my cabinet for a while!! Little trick I just learned with soups, put some in a muffin tin and freeze them then you easily have your own little portioned serving reading for you! Nice version, rich taste. Added some fresh thyme. Made this for dinner tonight….AMAZING! Thanks for a great recipe! I LOVE TO COOK. GET MANY RECIPES ONLINE.. MY HUSBAND SAID THIS WAS THE BEST SOUP I HAVE MADE IN SOME TIME. I DID MAKE SOME ADJUSTEMENTS.. I BROWNED ALL MY MEAT.. I ALSO PUT SOME COLOR ON MY IONIONS, CELERY AND GARLIC. ALSO ADDED TWO BEEF SHORT RIBS I HAD IN FREEZER. WONDERFUL !!!! I just made this and it is super yummy! I paired it with a beer bread, which we are waiting to finish baking! Everything looks good and easy. Thanks. I made this the other day and it was wonderful. I heated some up last night and all the liquid was pretty much gone. I used quick cooking barley since that is all I could find so I don’t know if that did it. It was still very tasty! This was absolutely delicious! Not many recipes wow me like this one did, and it was so easy to make. Thanks so much. This was, so, so good! I put it in the crockpot before work and after a long day, was so glad I didn’t have to cook when I got home. I omitted the mushrooms because I’m not a fan and increased the celery/carrots. I also whisked in some corn starch when it was done cooking to thicken the broth just a little bit. Thanks for another favorite! I finally got this soup made today. I couldn’t think to pick my beef up at the store until yesterday. I used a sirloin tip and I omitted the mushrooms. I am not a fan of them. My husband loved it. I think I will use less pepper next time. It was a nice change from just vegetable soup. I will be able to serve it a couple more days too. Hi Emily! I love all of your recipes. I just tried this last night and am eating the leftovers right now for lunch. Delicious! Thank you for converting to Smartpoints as well. My husband says this soup is “Amazing”! I happen to agree! Keep up the good work! LOVE, LOVE, LOVE your site. P.S. The barley was kind of hard to find in my market but I was able to find the Goya one in the dried beans section. Do you think I could use the quick-cook kind of barley, or would that be disasterous? Can you taste the tomato in this? I like barley too but it has gluten. If you can’t have gluten substitute with quinoa. I am going to try this with the quinoa tomorrow. 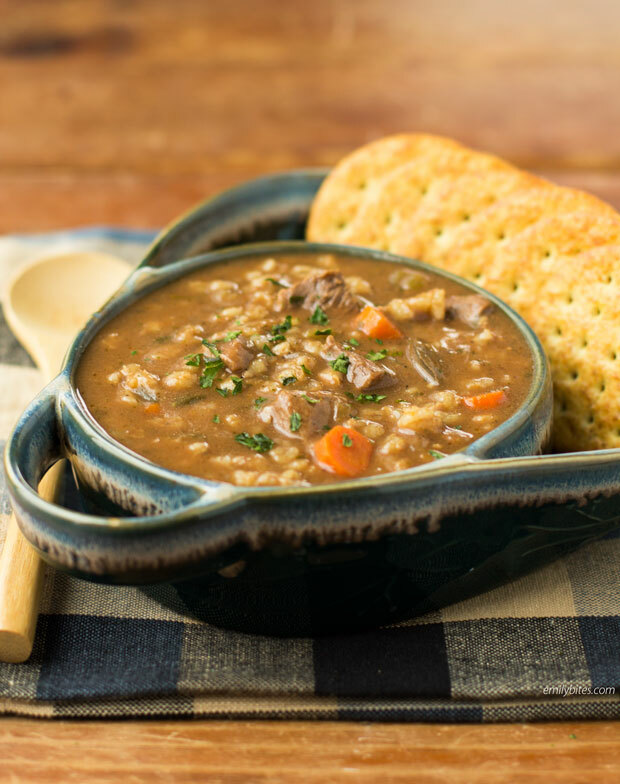 What size of a slow cooker is required for this beef barley soup recipe ? Just found this recipe and am going to try VERY soon. It looks so good. I went to lakeside.com to look for your soup bowls but no luck there. They didn’t even have anything similar. Could there be a different lakeside.com? The bowls I’m loving are the ones connected to a small plate for crackers, hot bread, etc. Can you give me any other tips on finding them? Thanks so much! Try qvc, I got some in the Temptations brand! Hi Emily. We are huge beef barley soup fans at our house. I made this last night for us for dinner and it was delicious! It WILL be made again. We have a ton of leftovers, too, so it will be lunch for me for a few days. Thanks again for another great dinner! This looks so delicouse, however, I am alergic to most grains as I am celiac and wonder if I could use rice in place of barley. Thanks look forward to your response. I have never tried it using rice or anything besides barley so I really can’t say with any certainty. Let me know if you try it! Recipe looks great and the pictures even more so! Made this yesterday – my Husband said its a definite keeper! This looks great and I would love to try it. I am, however, allergic to tomatoes and tomato products. Do you know of anything that would substitute for the tomato sauce in this recipe? Made this tonight. It was fabulous! Easy to make and even easier to eat. Even my picky 6-year old at it all and said, “I didn’t know I liked mushrooms?! ?” My 3-year old loved the barley, but mostly because she thought it was “stars,” like Campbell’s Chicken and Stars soup…but hey, she ate it! Thanks for another awesome recipe, Emily! Ok, silly question…is there a difference between a chuck steak and a chuck roast? Just want to make sure what cut to buy. Thanks! While this may sound silly, I have to ask… When you say celery stalk, do you mean the whole bunch or just a stick/rib? I don’t want to add too much or too little! I made this last night and it was wonderful! The best part is it made a huge pot, so I have lots of leftovers! Thank you! Yes, I love leftovers! I’m happy you loved it, Katie! I loved the beef barley soup! I wish you would put out out a cookbook of the best lunch and dinner entrees that you would recommend!!!! Thank You! Hi Linda, I’m glad you love it! I would love to do that someday! I made this today and it was delicious. My husband and I both loved it and it was perfect for the cold weather we are having here in NC. I had 1 – 1/2 cups and it was filling. Can’t wait to have more tomorrow night. My husband loves soups so this was perfect. Thanks and will continue using your recipes!!! Glad I found you. Been in WW 2 weeks…..
I’m glad you found me too, Amelia! I’m so happy you both loved the soup, thanks for commenting! I made this on a cold, cold day in Massachusetts – it was so delicious. I did not alter the recipe at all except for throwing a little extra barley in, which I really did not need to do. So perfect, thick and lovely for a cold winter’s day. Thanks! I’m so glad this was perfect for your cold day! This soup is amazing! Very filling! Next time I may get stew meat to cut down on time- would the points be the same? Thanks Emily!! I’m actually not sure what cut of beef they use for stew meat…it might even be chuck? I only have the points calculated for the ingredients I made it with but you could definitely check if the recipe builder has stew meat listed and compare! I saw this on Yummy with it saying 0 for cholesterol. That seems impossible. No matter how lean the beef is, there will be fat and cholesterol from everything I have read. How can this beef barley soup be so low in fat and cholesterol? This was literally the best beef stew my husband and I have ever had. Making it for the second time next Friday for company! Are you kidding me with this??! I cannot believe how INCREDIBLE this is. The only bad part is having to smell it ALL DAY LONG. I will probably add some extra Worcestershire next time…but I love that flavor so it’s totally a personal preference. Everyone who tasted it could not stop talking about it. I have eaten it 3 days in a row and would gladly eat it the rest of the week if I had more leftovers. Hey Emily! Quick questions I absolutely could not find barely! 🙁 Could I use Brown rice instead? Hm, I honestly don’t think I’ve ever made anything with rice in my slow cooker so I’m not 100% sure firsthand how it holds up. I just did a quick google search for soups with rice in the slow cooker and got a bunch of results, so I’m guessing it would be fine but I haven’t tried it myself to be sure. Let me know if it works out! I made this today and we loved it. I only had 4 cups of beef stock so it wasn’t quiet a soup but still delicious. I also browned the meat first and added a few sprigs of thyme and a bay leaf. I didn’t add salt or pepper as people said the pepper was too much but found it did need the pepper so we just put some cracked pepper on top. It was really yummy and I am so happy there was heaps to freeze for later. Thanks for the recipe! Have this in my slow cooker RIGHT NOW!!! Would you count a 1 cup serving as 4 or 5 SP? Thanks! 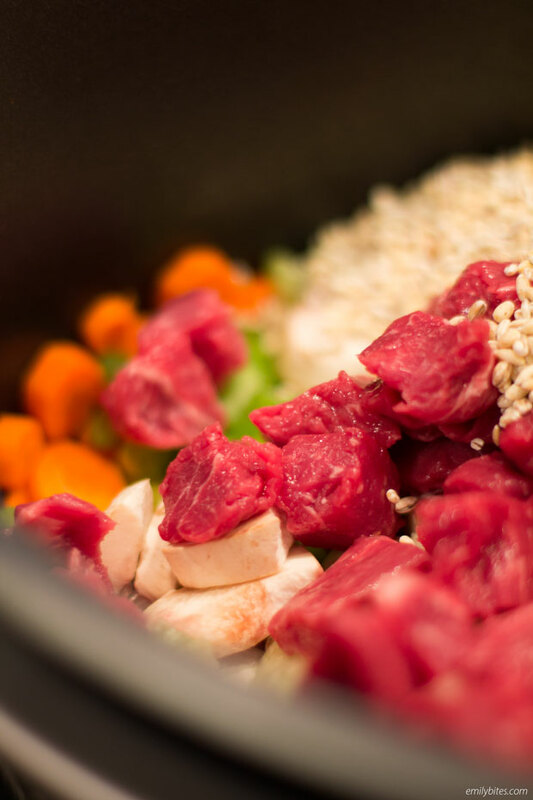 Do you need to brown the beef before putting it in the slow cooker? I made this tonight and adapted it for the instant pot, it was amazing!!! I’ve made this soup several times and everyone loves it! It’s a real comfort food. It’s an excellent recipie. Thanks for sharing. Thank you for this recipe! I have made this a couple times and it is delicious. We are supposed to have a snow storm tomorrow and glad I already planned to serve it at a dinner party tomorrow night. It will a perfect, hearty entree served with bread and salad and completed with warn gingerbread with a brandy whipped cream while the snow is coming down! Emily , I LOVE all your recipes !! I cant wait to make this one !! We’re currently snowed in and I want to make this today but only have chicken stock on hand. Do you think it would work in a pinch or taste weird? Thanks! I think it’s definitely worth a shot! I’m guessing it will taste different but I don’t think it would be bad-different. Let me know what you think! Thanks for such a quick reply! I used the chicken stock and it was delicious. Perfect dinner for a snowy winter day. Thanks again! This was absolutely amazing!!! Such a delicious, rich flavor!! I am so excited to eat these leftovers through the week. This was perfect for our rainy day! Can NOT believe the huge flavor/comfort for only 6 SP. Thank you so much for all you do!! I know it’s Memorial Day weekend but it was chilly and damp in NY so I decided to make this recipe , absolutely delicious !!! My kids all enjoyed it and thank you for giving the smart points !!! I just made this for my family and they LOVED it! Yay! They asked me if I was going to add it to the rotation. A new recipe, and it’s WW friendly, and it’s delicious! Thank you for sharing it! We don’t have a slow cooker. Could I make this in a dutch oven on the stove? Or in an instant pot? If so, what would I have to change to do that? This looks so delicious, and I know my (super-picky) son would love it. Could you make this with out beef for Friday during Kent? If so any suggestions on what to do.